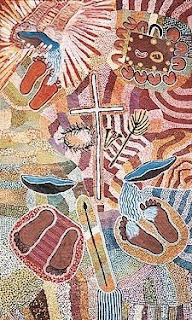 Faith and Theology: God and indigenous Australians: recognising or confessing? God and indigenous Australians: recognising or confessing? This is not so much a confession of the church’s faith in Christ as an authoritative pronouncement about the specific mode of God’s self-revelation. God was at work among (presumably all) indigenous peoples ‘through law, custom and ceremony’. The crucial question to put to this document is that of the church’s fundamental posture or position. Where does the church stand? Where is the church positioned in order to formulate such a fixed definition of the divine action in human history? Can a confessing church make such authoritative pronouncements? Or does the church first need to relinquish its confessing stance, its posture of vulnerable openness before Jesus Christ, in order to define God’s activity in this way? Can such doctrinal pronouncements really remain open to the free and surprising work of Christ in the world? Or has the eschatological untidiness of the Basis of Union been relinquished in favour of a highly determinate decision about the precise nature of divine action in history? In short, can a confessing church adopt a position of privileged insight into the mysteries of the divine will – a theological bird’s-eye view? The language of the preamble betrays the fact that this document is indeed an authoritative, objective pronouncement rather than a confession of the church. It is spoken not from the position of obedient confession, but from a superior viewpoint. God’s activity in the world is not so much confessed as grasped and assimilated within an all-encompassing doctrinal schema. Thus the preamble’s ten statements are said to be ‘recognised’ by the church. What does it mean for the church to ‘recognise’ the fact that God’s self-revelation in Australia has taken place through law, custom and ceremony? Surely it indicates that the church occupies a privileged position. Specific information about God’s activity – information not available in scripture – is somehow at the church’s disposal. Although the church knows God only in Christ, it now also commands knowledge of God’s action extra Christum. Instead of confessing, instead of remaining open and expectant to God’s surprising work in the world, the church is said to ‘recognise’ these facts. Not content to bear witness, the church speaks (in all ten paragraphs) with the voice of an anonymous historian, informing the world about the precise location of God – and of the Uniting Church! – in Australia’s history. Instead of standing ‘between the times’ and confessing from a position of weakness and vulnerability, the church has mastered history. It occupies a theological ‘view from nowhere’, an objective position from which even God is viewed as though from high above.